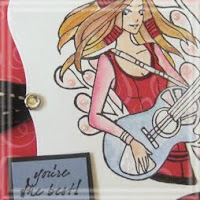 Paper Makeup Stamps: April Sneak Peeks, Day 3 - Let's ROCK! It's time for day 3 of our sneak peeks for April! 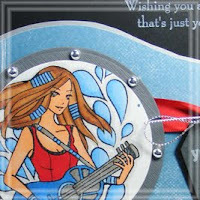 Today's sneak peeks are all ROCKIN'! But joining in the music is Milo the mouse on Drums and Eye Pod, the music lovin' monster! Check out these sneaks from the Paper Makeup Artists! Don't forget to leave a comment here today with your favorite stamp image and you'll be entered to win the ENTIRE release of bare rubber valued at $75!! Our release party is TOMORROW! Please join us for our release chat (with fun, games, chatter, prizes and just good times) at 8pm CST when the stamps go live on the site! Party Chat will be in our forum. Eye-pod just cracks me up, love that lil smirk he has finding just the right song lol. These are all AWESOME! I love all of these! How cool that Moody is now in rubber, she is my fave Moody! I have to say that my favorite today is Eye-Pod, he is adorable!!! Hehehehhehehehe, I LOVE Eye Pod - I was truly laughing out loud when I saw him! how CUTE are these?! 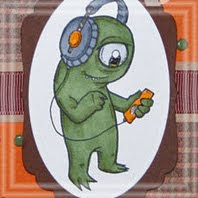 i LOVE Eye Pod - he's fabulous, and those giant ol' skool headphones are ROCKIN'! :) the new sneaks have been amazing! 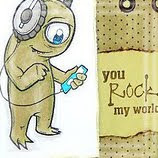 i love the monster rocking out with his headphones. what a great collection of images. SO CUTE!! These will be high on my list as I have several musical teenagers in my life. Milo the drummer has to be my favorite as my oldest nephew is in college for music, and yep, he's a drummer! I absolutely love the new Moody for Rock image. Loving the new releases! 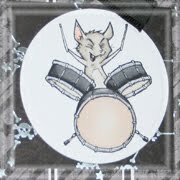 My favorite today is the little bat on the drums! SO much fun! 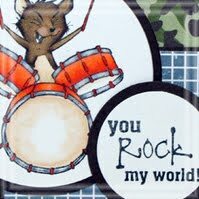 ok- no doubt about it, the drumming mouse is the BOMB!! I love it! Can't wait for release day, can not wait!!! Oooooh, my favourite is milo on the drums, thanks for the chance to win. 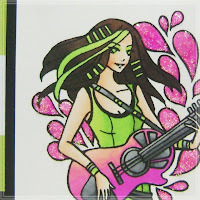 I just love the stamps from the release! Everything is so cute!!! I am loving these!! More awesome images! Fabulous new releases. Eye Pod just makes me smile, I think he's got to be my favourite. Oh my, just ONE???? Hehe! I'd have to say the butterflies, Greg and that cute iPod monster!! I just love music sets and this is for sure a Rockin set. I just love the drums and the girl is cute. I can't wait to see the rest of this set. EYE-Pod is the cutest thing! I can see lots of use for my own perpetually 'plugged in' kids and their friends. He's perfect for a iTunes gift card gift.